The City of La Habra Heights is a small, unique community located approximately 25 miles east of Los Angeles on the border of Orange County and Los Angeles County. It is surrounded by Hacienda Heights, Rowland Heights, La Habra and Whittier. As of the 2010 census, the total population of the city was 5,325. The median age was 47.6. The city is made up of primarily White (72.4%), Hispanic / Latino (23.5%), Asian (15.8%) and other (6.3%). There were 1,880 housing units in the city with a 4% vacancy rate. The vast majority of the occupied units are owner occupied (93.2%) with a small percentage being occupied by renters (6.8%). The city has an average housing density of 303.2/mile (116.7/km). There were 1,085 households in the city. Approximately 30% of all households in the city have individuals under the age of 18. Almost 39% have individuals 65 years and over in their households. The majority of these households are family households (82.6%). Of the family households, 26.9% of them had their own children under the age of 18 living with them, 71.4% were a husband and wife family, 6.8% were female householders with no husband present, and 4.4% were male householders with no wife present. The average household size is 2.94 and the average family size is 3.21. 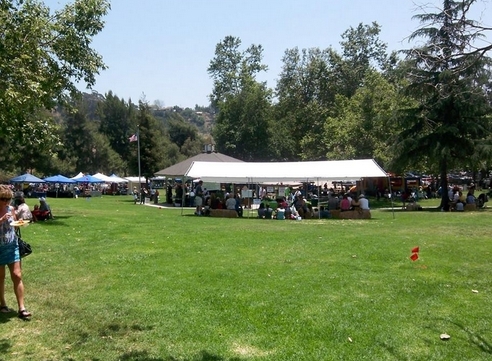 The City of La Habra Heights Park and Recreation Commission was created on August 10, 1995. Prior to that, it was referred to as a “Committee.” The Parks and Recreation Commission consists of five members appointed by the La Habra Heights City Council. Three alternates also serve on the Commission. The Commissioners serve for a two year term. La Habra Heights, CA 90631. – Advise the La Habra Heights City Council in all matters pertaining to parks, community recreation, parkways and street trees. – Consider uses and activities for continuing use of The Park and The Park building. – Consider ways to develop The Park and The Park building, accommodate individuals and groups, and make recommendations to the City Council and City Manager. – Make budgetary recommendations to the City Council and City Manager related to Parks and Recreation. – Assist in planning and promotion of Parks and Recreation related activities and events. – Performs duties as set forth in Ordinance No. 201 and other related resolutions. 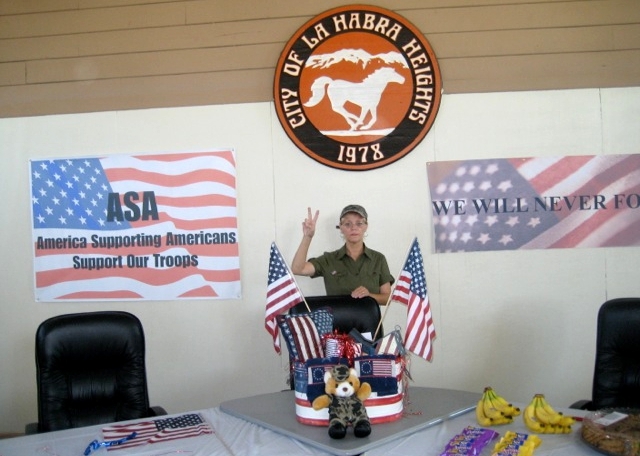 Karen Vipperman has been involved with the La Habra Heights chapter of America Supporting Americans (ASA). America Supporting Americans (ASA) started in 1967 when Sergeant Joe Artavia wrote his big sister from Vietnam asking her to do something to help raise the morale of his unit. Linda Patterson, as a young woman living in San Mateo, California, convinced her hometown to “adopt” her brother Joe’s unit in Vietnam. Believing that the individual soldiers charged with fighting an unpopular war desperately needed to feel the interest and concern of communities back home, San Mateo agreed to Linda’s request. As a result, the morale of Joe’s fellow soldiers was, in Joe’s own words, “raised as high as the clouds.” Tragically, Joe who was just nineteen was killed in a firefight trying to aid a fallen trooper three weeks after the adoption took place. To this day the men in his unit gratefully remember him and Linda each time they look at a cherished medallion that reads, “City of San Mateo, Adopted Son.” After Joe’s death, Linda traveled to Vietnam to personally deliver the medallions San Mateo had issued in honor of Joe and the men in his unit. Many of the men carry those medallions to this day. Having geared up the adoption program again during Desert Storm and now for a third time in the wake of September 11, ASA has facilitated the adoption of many units by towns and cities across the country. Through these adoptions, both soldiers and civilians are discovering the unique and crucial link that exists between the men and women of our Armed Services and the American citizens they are charged to protect. The centerpiece of ASA’s work is the Adopt-A-Unit Program. Believing that a strong, supportive connection between young men and women of our armed forces and the civilian communities they are ready and willing to serve is crucial to morale, ASA has committed itself to building and strengthening this link. The ASA Foster-A-Unit Program provides the opportunity for business and organizations not involved in the Adopt-a-Unit Program to support the morale of troops serving in military units both at home and overseas while they wait for adoption through the ASA Adopt-a-Unit Program. A business, community group, or school group not involved with local adoption activities, can foster a military unit by sending one or two rounds of letters and/or care packages to troops who are serving in harms way. ASA encourages adoptive communities to use their adoption programs to expand young people’s understanding of America’s role in global affairs, of the role the military plays in the American political system, and of the experience of American servicemen and women. With this in mind, YCAP enables teachers to use their community’s participation in the Adopt-a-Unit Program to enrich their curriculums and to add new dimensions to the learning that goes on in their classrooms. 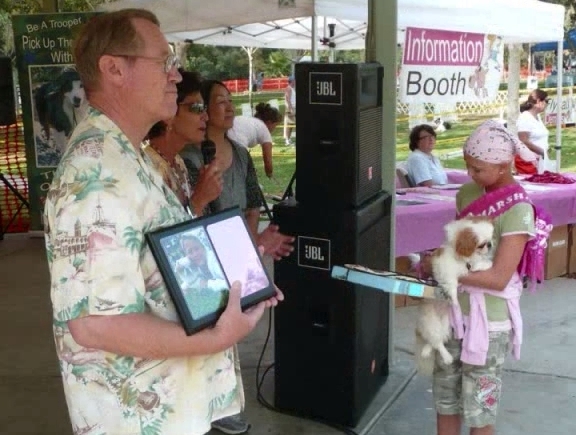 Karen Vipperman has been a Chair Person for La Habra Heights Avocado Festival. Each year in mid-May the city of La Habra Heights celebrates the Hass avocado at its Annual La Habra Heights Avocado Festival – an avocado-focused, agricultural and community festival held in mid-May every year. All commercial, fruit-bearing Hass avocado trees have been grown from grafted seedlings propagated from a single tree which was grown from a seed bought by Rudolph Hass in 1926 from A. R. Rideout of Whittier, California. In 1926, at his 1.5-acre grove at 430 West Road, La Habra Heights, California, Hass planted three seeds he had bought from Rideout, which yielded one strong seedling. When the tree began bearing odd, bumpy fruit, his children liked the taste. Hass patented the tree in 1935 (the first US patent on a tree). The mother tree stood for many years in front of a residence in La Habra Heights. The tree died when it was 76 years old and was cut down on September 11, 2002. Two plaques by the private residence at 426 West Road mark the spot where it grew. All commercial, fruit-bearing Hass avocado trees have been grown from grafted seedlings propagated from a single tree which was grown from a seed bought by Rudolph Hass in 1926 from A. R. Rideout of Whittier, California. At the time, Rideout was getting seeds from any source he could find, even restaurant food scraps. The subspecies of this seed is not known and may already have been cross-pollinated when Hass bought it. In 1926, at his 1.5-acre grove at 430 West Road, La Habra Heights, California, Hass planted three seeds he had bought from Rideout, which yielded one strong seedling. After trying and failing at least twice to graft the seedling with branches from Fuerte avocado trees (the leading commercial cultivar at the time), Hass thought of cutting it down but a professional grafter named Caulkins told him the young tree was sound and strong, so he let it be. When the tree began bearing odd, bumpy fruit, his children liked the taste. As the tree’s yields grew bigger, Hass easily sold what his family didn’t eat to co-workers at the post office. The Hass avocado had one of its first commercial successes at the Model Grocery Store on Colorado Street in Pasadena, California, where chefs working for some of the town’s wealthy residents bought the new cultivar’s big, nutty-tasting fruit for $1 each, a very high price at the time (more than US$15.00 of inflation adjusted value by 2007). Karen Vipperman has been a Board Member for Pet Prescription Team, La Habra Heights. Pet Prescription Team was founded in 2003 for one purpose: to help pet owners train and certify their family pets for assisted therapy. There is a lack of information and hands on training for those that desired to train and certify their personal family dog for therapy work. PPT instructs, trains, evaluates, certifies, insures and supports dog assisted therapy.